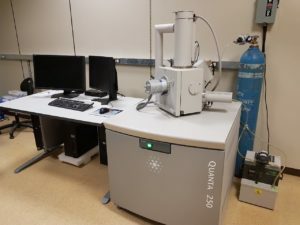 The Quanta line of scanning electron microscopes are versatile, high-performance instruments with three modes (high vacuum, low vacuum and ESEM) to accommodate the widest range of samples of any scanning electron microscope (SEM) system. 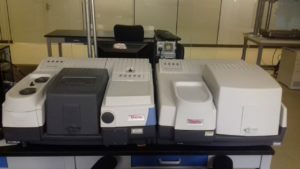 All the Quanta SEM systems can be equipped with analytical systems, such as energy dispersive spectrometer, wavelength dispersive x-ray spectroscopy and electron backscatter diffraction. In addition, the field emission gun (FEG) systems contain a S/TEM detector for bright-field and dark-field sample imaging. Another variable that changes amongst the SEM systems is the size of the motorized stage (50mm, 100mm, and 150mm) and the motorized z-range (25mm, 60mm, and 65mm, respectively). The Quanta 650 and 650 FEG SEMs are each designed with a roomy chamber, enabling the analysis and navigation of large specimens. 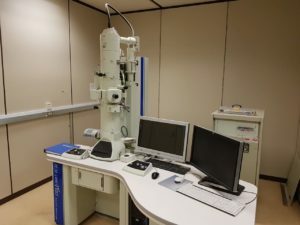 The JEOL JEM-1400 series 120kV Transmission Electron Microscope is widely accepted for its ease of use and high resolution imaging and analysis. Applications include pathology, biology, quality control, nanotechnology, polymer, and materials development. Introduced in 2017 and derived from the highly successful JEM-1400(Plus), the JEM-1400Flash makes it easier for the user to first view samples at low magnification before studying the fine structures of interest at high magnification. To smoothly transition from low to high magnification and acquire higher-throughput image data, the JEM-1400Flash has an integrated high-sensitivity sCMOS camera, an ultra-wide area montage system, and an OM (optical microscope) image linkage function. 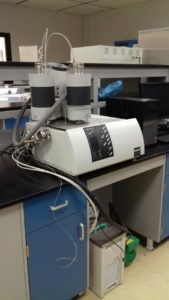 To increase the throughput, the JEM-1400Flash is equipped with a TMP, which besides resulting in an oil-free column vacuum, also allows for instantaneous sample exchanges. The JEM-1400Flash features high resolution/high contrast imaging, outstanding S/TEM analytical performance, elemental mapping with the latest large-area SDD detectors, cryomicroscopy, 3D tomography, and montaging. A compact, easy-to-use TEM, it supports optional STEM digital imaging/scanning circuitry with STEM images (BF/DF) on the standard GUI. AFM microscopy provides high resolution 2D and 3D images by scanning a physical sharp probe over a sample surface. The microscope has several scanning modes available: Tapping mode, Contact mode and PeakForce QNM (Quantitative NanoMechanics). The latest one (PF-QNM) enables quantitative measurements of nano-scale material properties such as modulus, adhesion, deformation and dissipation. 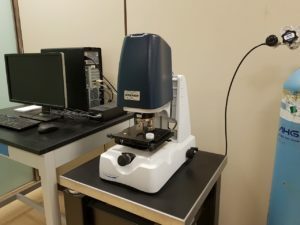 Our AFM microscope is equipped with a Thermal Analysis accessory (Nano-TA), which allows to locally characterize the thermal behavior of materials. The analysis can be done on many types of samples: metals, polymer, composite, adsorbed molecules, thin films, biofilms and cells. AFM manipulations can be released in ambient and liquid environments. 3D surface measurement (three-dimensional surface measurement) is used by both the industrial sector and scientific community to drive the success of critical research projects, crucial developments, and fundamental productions and process controls. 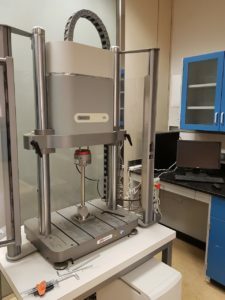 The 3D surface measurement parameters (S parameters) were defined in 1991 by the attendees of the first EC Workshop and have since been developed in accordance with ISO standards to complement the traditional 2D (two-dimensional) metrology R parameters. The ElectroPulsTM E3000 is a state-of-the-art, all-electric test instrument designed for dynamic and static testing on a wide range of materials and components. It includes Instron® advanced digital control electronics, DynacellTM load cell, Console software, and the very latest in testing technology – hassle-free tuning based on specimen stiffness, electrically operated crosshead lifts, a T-slot table for flexible test set ups and a host of other user-orientated features. Powered from a single-phase supply it requires no additional utilities for basic machine operation (for example, pneumatic air, hydraulics, or water). The Fatigue Tester uses powerful solenoids to provide smooth loading to levels of up to 400N. The force levels are displayed and controlled on a personal computer. Up to four specimens at a time can by cycled while suspended in 37’C water. No more tying up your single-axis test machine for weeks! With the Fatigue Tester, the loading routine can be varied to apply a sinewave, triangular or step wave at frequencies up to 2Hz and cycle from 10N to 350N. Closed-loop control is provided by in-line load cells to continuously calibrate the individual coils. The shrinkage that accompanies curing of dental composites is one of the leading drawbacks of this type of restorative material. A variety of differing testing methods have been tried over the years to measure this shrinkage and the stress that it leads to. But these methods have been difficult to use and involve highly specialized devices. 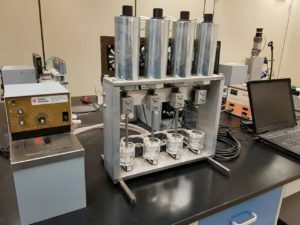 Now Proto-tech has developed a new system that can accurately measure polymerization stress and shrinkage easily and affordably. 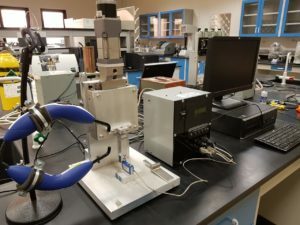 Based on the cylindrical testing geometry pioneered at ACTA and improved at OHSU, the Proto-tech polymerization stress tester uses a precision positioning table driven by a stepping motor and controlled by custom software. The preparations for each specimen are quick and easy to perform. A 200N load cell senses the polymerization stress, and the level of compliance correction can be adjusted up to 100% compensation for compliance of the load cell. The up and down motion of the positioning table is controlled through a command module. The testing program can be set to measure either the polymerization stress or the polymerization shrinkage of the composite. The testing fixtures allow for light curing to be directed to both the top and bottom sides of the specimen. 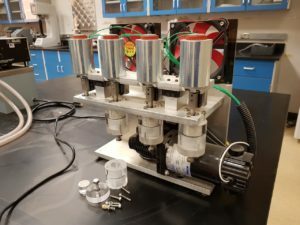 Proto-tech has added a unique new shear bond strength tester to its line of dental materials testing machines. The new tester uses a simple cylindrical test geometry in a compact, easy-to-use format. A precision solenoid is a powerful but reliable method to apply continuously variable load, while an inline load cell monitors and records the peak load. The system has the advantage of operating in force control mode, and has the option to vary the rate at which force is applied. Typical screw-driven machines operate in stroke-control mode, which means that the loading rate depends upon the stiffness of the material, which can add uncertainty to the results. The ideal tool for studying the wear behavior of dental restorative materials is here. Developed with the research team at the Department of Biomaterials and Biomechanics at Oregon Health Sciences University, our goal was a machine that was easy and reliable to use, while producing the same clinically realistic wear patterns that the Proto-tech system is known for. 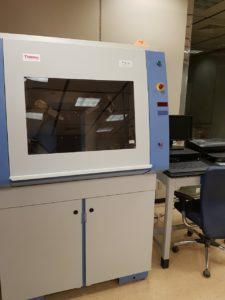 The result is the Oral Wear Simulator, a quantum leap in composite wear testing that is the only wear machine which reproduces the wear of dental restorative materials well enough to be called an “oral wear simulator”. Powder XRD is one of the most established techniques for identifying and characterizing polycrystalline materials with respect to their crystallography, polymorphic structures, phases and crystallinity changes.The ARL X’TRA Powder Diffractometer is designed with a modular approach to provide full flexibility, higher diffraction intensities, and superior resolution for a large range of applications covering both inorganic and organic polycrystalline materials. Identification of single or multiple phases in an unknown sample. Quantification of known phases of a mixture. Crystallography – solving crystal structure. Nonambient analysis – crystal structure changes with temperature, pressure or gas environment. Surface and thin film analysis. 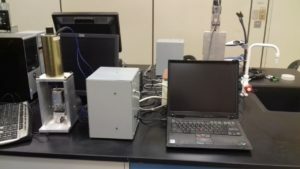 It is a FTIR spectrometer (Nicolet 6700 FTIR) coupled with a FT-Raman module (NXR 967 FT Raman). The heart of the TMA 402 Hyperion® is a highly precise inductive displacement transducer (LVDT). This technology has stood the test of time; it is also used for dilatometers and allows measurement of even the smallest of length changes, into the nanometer range (digital resolution of 0.125 nm). The force operating on the sample is generated electromagnetically in the TMA 402 Hyperion®. This guarantees a quick response time for experiments with a changing load, e.g. tests on creep behavior. 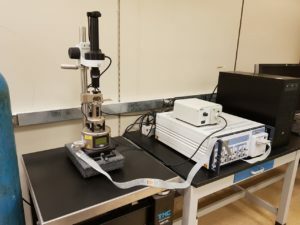 A highly sensitive force sensor (digital resolution < 0.01 mN) continuously measures the force exerted via the push rod and readjusts it automatically. This sets the TMA 402 Hyperion® apart from other instruments, which use only preset values. The electronic control system for the TMA 402 Hyperion® allows forces to be set in the mN-range. This enables testing even on sensitive materials such as thin fibers or films. The force operating on the sample can be altered via the software in a stepwise or linear fashion. This makes it particularly simple to carry out such analyses as creep or stress sweep tests. The premium version of the TMA 402 Hyperion®, the TMA 402 F1 Hyperion®, provides even more capabilities. From single pulse in rectangular or ramp form to continuous modulation with a freely selectable frequency (up to 1 Hz), every possibility is covered. This model is particularly well-suited for determining visco-elastic material properties such as elasticity and creep modulus. Copyright © 2018 DOR All rights reserved.